PARENTSS: Dr Ashok Kumar Rout (Father), Sasmita Dhal (Mother). ACADEMIC QUALIFICATION: Commerce graduate from BJB College, Bhubaneswar. PROFESSION: Serving in Indian Oil Corporation Limited as an officer since January, 2016. * On Sept 4, 2014, she was felicitated by the AICF for winning gold medal in the Women’s Olympiad board five at Tromso, Norway. India Cements Ltd MD N Srinivasan, who graced felicitation ceremony at Chennai as chief guest, handed over a cash award of Rs 60,000 to Padmini. * The Press Club of Odisha honoured her with the Sprit of Sports Award and a cheque of Rs 25,000 in Bhubaneswar on October 27, 2013. * Received the Biju Patnaik State Sports Award as the Outstanding Sportsperson of the Year 2007 and cheque of Rs 1 lakh at Bhubaneswar on March 5, 2011. * Received the 16th Ekalabya Award along with a cheque of Rs l lakh as the outstanding sportsperson of the year 2008 from IMPaCT at Bhubaneswar on August 30, 2009. * She was coached for two years by Satya Ranjan Pattnaik and occasionally by IMs Neeraj Kumar Mishra and Sekhar Chandra Sahu. * Received coaching from Ukraine GM Georgy Timoschenko twice in 2008 and 2009. * Participated in the Grand Master coaching camp, conducted by AICF at Calicut from Feb 6 to March 5, 2004. * Won the title in the State Under-9 Chess Championship, held at Nayagarh from August 27 to 29, 2003. * Won the title in the State Under-11 Chess Cchampionship, held at Cuttack on Dec 6 and 7, 2003. * Won the title in the State Under-13 Chess Championship, held at Puri from Nov 13 to 15, 2004. * Won the title in the State Under-17 Chess Championship, held at Rourkela from Sept 5 to 8, 2004. * Won the title in the 15th State Junior (under-19) Girls Chess Championship, held at Bhubaneswar from March 18 to 19, 2005. * Won the U-12 Girls’ title in the 45th Orissa State Chess Championship, held at Rourkela from June 4 to 9, 2005. * Won the title in the State Women’s Chess Championship at Puri (June). * Won the title in the State U-11 Boys & Girls Chess Championship at Puri (August 13-14). * Won the title in the State U-19 Open Boys & Girls Chess Championship at Bhubaneswar (October 23-24). * Won the title in the State U-13 Girls` Chess Championship at Puri (June 5-7). * Won the State Sub-junior(U-15) Open championship at Puri (June 7-9). * Won the State U-17 Girls` title at Bhubaneswar (July 16-17). * Won the State U-19 Girls` title at Bhubaneswar (July 30-31). * Secured first position in State Women ‘B’ Chess Championship at Bhubaneswar (May 8-9). * Finished runner-up in the 1st State Blitz Chess Championship at Bhubaneswar on May 24. * Won the title in the XIX National U-11 Boys & Girls Chess Championship at Nagpur, Maharashtra (Sept 24-30). * Won the National u-13 girls` title at Kolkata on Dec 2005 to January 2006. * Won the National u-13 girls` title at Bhiwani, Haryana in December. * Finished runner-up in Women’s National ‘B’ Chess Championship at Hyderabad (May 21-28). * Achieved a hat-trick by winning the National u-13 girls` title for the third time in a row at Andheri Sports Complex in Mumbai Dec 2008 to January 2008. * Runner-up in under-20 girls’ section of the Junior National Chess Championship at Tedapalligudem in Andhra Pradesh (Nov 3-11). * Became the first Orissa girl to qualify for National `A` by finishing ninth in the National `B` Championship at Kolkata on August 24. * Finished runner-up in the 24th National Junior (u-19) Girls Chess Championship at Chennai on Sept 28. * Won the title in the 25th Junior (Under-19) Girls National Chess Championship at Puri on October 9. * Finished fourth in the 37th Premier National Women Chess Championship at Bhubaneswar in January, 2011. 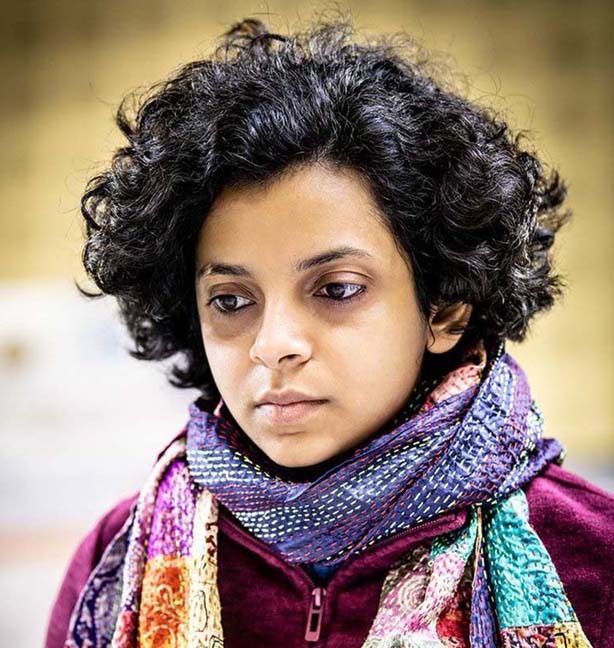 * Won her maiden National Women’s Premier chess title with a round to spare in the 48th edition of the championship, which was held at Sangli in Maharashtra from Oct 25 to Nov 5, 2014. * Retained title in the National Women Premier Chess Championship, held at Kolkata from Nov 12 to 24, 2015. * Led Petroleum Sports Promotion Board to title triumph in the 14th National Team Chess Championship for Women, held at KIIT Law School in Bhubaneswar from Feb 8 to 14, 2016. She also pocketed the individual top-board prize. * Achieved a glorious hat-trick by winning the title for the third successive time at the 43rd National Women Premier Chess Championship, held at Punjab Bhawan in New Delhi from Nov 3 to 14, 2016. * Won the 4th successive title and the top prize of Rs 1.75 lakh in the National Women Premier Chess Championship, the 44th edition of which was held at Surat (Gujarat) from Nov 25 to Dec 6, 2017. * Helped Petroleum Sports Promotion Board win gold medal in the 16th National Team Chess Championship for Women, held at KIIT University in Bhubaneswar from Feb 8-14, 2018. * Helped Indian women team win the bronze medal in the Asian Nations Chess Championship at Ja Huang in China on May 26. * Secured her third and final IM norm at the Philadelphia International Tournament in the USA on July 4, 2012. * Won a gold medal in under-18 girls category of the Commonwealth Chess Championships at Chennai on Dec 1, 2012. * Won the girls’ bronze medal in the World Junior (u-20) Chess Championship, held at Chotowa-Czarna, Poland from August 3 to 16. * Won the bronze medal in the girls category of the Asian Junior Chess Championship at Chennai on June 23. * Secured the WGM norm and the title in the 2nd SCS Open GM Tournament at Bhubaneswar on May 29, 2010. * Won a gold medal in u-16 girls category of the Parsvanath Commonwealth Chess Championship at New Delhi on May 18, 2010. * Gold medal in women’s section of the 17th Asian Continental Chess Championship, held at Makati, Philippines from Dec 10-18, 2018. * Three team medals (gold in blitz, silver in rapid and bronze in classical) and two individual medals (silver and bronze) in the Asian Nations Cup Chess Championship, held at Hamedan in Iran from July 26 to August 4, 2018. * Bronze medal in women’s rapid team event (partner Tania Sachdev) of the 5th Asian Indoor & Martial Arts Games, held at Ashgabat, Turkmenistan from September 17 to 27, 2017. * One individual bronze medal each in women rapid and blitz events of the Asian Nations Cup Chess Championship, held at Novotel Hotel in Abu Dhabi from March 28 to April 8, 2016. * Silver medal in Chinese Chess Team Tournament, held at Zhongshan, China from 11th to 16th July, 2015. * Gold medal in women category of the Commonwealth Chess Championship, held at Hotel Park Plaza in New Delhi, India from 22nd to 30th June, 2015. * Secured the International Master (IM) title and first Grand Master (GM) norm in the Masters category of the Tradewise Gibraltar Chess Festival, held at Caleta Hotel in Gibralter (England) from January 27 to February 5, 2015. * Gold medal on Board-5 in women section of the 41st Chess Olympiad, held at Tromso, Norway from 1st to 14th August, 2014. * Emerged Champion in Chess for Girls, Asia 2014, Rapid Tournament, held at Ho Chi Minh City, Vietnam from 1st to 8th July, 2014. * Bagged four medals Asian Nations Cup Chess Championship, held at Tabriz, Iran from 20th to 30th May, 2014. Medals included Gold on Board 2 of women team blitz competition, Silver on Board 3 of women team rapid competition, Silver on Board 5 of women team standard competition and Bronze on Board 5 of women standard competition. * Gold medal in U-18 girls category of the Commonwealth Chess Championship, held at Chennai, India from 22nd Nov to 1st Dec, 2012. * Gold medal on Board 5 in Blitz event, bronze medal in team event and bronze medal on Board 5 Women Team event of the Women Team Chess Championship, held in Asian Nations Chess Cup, held at Zao Zhuang, China from 14th to 25th May, 2012. * Bronze medal in World Junior Girls Chess Championship, held at Chotowa, Poland from 2nd to 17th Aug, 2010. * Bronze medal in Asian Junior Girls Chess Championship, held at Chennai, India from 15th to 23rd June, 2010. * Gold medal in U-16 girls category of the Commonwealth Chess Championship, held at Delhi, India from 10th to 18th May, 2010. * Gold medal in Asian Junior (U-20) Girls Chess Championship, held at Colombo, Sri Lanka from 1st to 8th July, 2009. * Gold medal in World U-14 Girls Chess Championship held at Vungtau, Vietnam from Oct 18-30, 2008. * Silver medal in U-14 girls category of the Nagpur Mayors Cup Commonwealth Chess Championship, held at Nagpur, India from Sept 28 to Oct 6, 2008. * Gold medal in Asian U-14 Girls Chess Championship, held at Teheran, Iran from July 15-22, 2008. * Silver medal in Asian Junior Girls Chess Championship, held at Mumbai from Dec 13-21, 2007. * Gold medal in U-14 girls category of the Parsvnath Commonwealth Chess Championship, held at New Delhi, India from 2nd to 10th Dec 2007. * Became the youngest and second Woman International Master of Orissa by obtaining her third and final norm in the World Junior (under-20) Girls` Championship at Yerevan in Armenia in October 2007. She, however, finished 28th in the final standings. * Certificate of Title Result, 2nd WIM Norm in 12th Open International Tournament, held at Balaguer, Spain Chess from July 16-25, 2007. * Bronze medal in Asian Girls U-16 Chess Championship, held at Tashkent, Uzbekistan from June 27-July 8, 2007. * Gold medal in Commonwealth Chess Championship, held at Mumbai, India from Nov 19-29, 2006. * Gold medal in U-12 girls category of Asian Youth Chess Championship, held at Tehran, Iran from June 23-July 1, 2006. * Bronze medal in Women International Rating Tournament, held at Sangli, Maharashtra from May 24-30, 2006. * Gold medal in the U-12 girls category of the Asian Youth Chess Championship, held at New Delhi from Dec 7-15, 2005. * On Feb 6, 2016, Housing & Urban Development Department of Government of Odisha named her as one of the five Brand Ambassadors of Swachh Bharat Mission (SBM). * She reads Gita everyday and as per Krishna`s instruction tries to take the good and bad equally. * Hard work has been the secret of her success. She practices eight to 10 hours a day and six days a week. * Padmini’s father, Dr Ashok Rout, took a year’s leave (in August 2009) from his profession as a lecturer in chemistry to give his daughter’s career a fruitful shape. * Became a Woman Fide Master (WFM) by virtue of bagging the title in the Asian under-12 championship at New Delhi in December, 2005. * Star Consultancy Services signed a three-year contract (2008 to 2011) to bear the cost of her coaching and participation in open international tournaments. * With just a month’s effort, she secured 82 per cent marks in her high school board examination in 2009. * Padmini is not a good eater and forgets food when engaged in a game. * Received special cash award of Rs 2.9 lakhs from the Central Government for her international medal winning performances in 2008.